Craftin' Caro: new "eScape" bundle -- only $35! new "eScape" bundle -- only $35! Put down the phone, turn off the computer, and break free from the 'e'! Remember when you used to receive letters in your mailbox instead of your inbox? 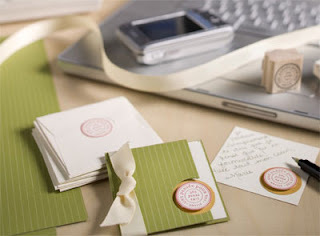 On Wednesday June 25, Stampin' Up! is taking the day to unplug and unwind, and reconnect on a personal level with friends and loved ones through handmade cards. I invite you to eScape with me this month and try it out for a day too! I'll be having a free eScape Open House on the 25th, so you can come by, stamp some cards with me & chit-chat. You'll eScape from e-mail & technology for an hour or so amd make a card you can send to someone you care about! To celebrate this eScape, here's a specially bundled stamping kit for you. It gives you some cute stamps, ribbon, ink and Love Notes -- everything you need to make some fun little cards to hand out to the special people in your life (maybe tucked in a lunchbag or briefcase?). p.s. My June e-Newsletter is going out tomorrow with **7 great projects***, just for my newsletter scubscribers. If you're in Canada, why not sign up to receive it and get all the great scoops?! Oooo Caroline I'd like to do this, but I already have that stamp set. Any possibility of trading for another one?